Seatallan is a large but rather anonymous fell at the western end of Wasdale. Its long western flanks form the start of the high ground when coming from the west, and this gentle slope rises for over 2,000 feet from the outskirts of Gosforth to the summit. Seatallan doesn't really have a clear western boundary. The long western slope continues on uninterrupted to the River Bleng, which curves around the western tip and joins the Irt a mile and a half to the east, but this area doesn't really feel like it belongs to the parent fell. The best views of Seatallan itself come from the east, where it appears as a two-stepped fell, with the final summit, then a grassy shelf, then the deep valley of Nether Beck. Seatallan can be approached without any problems from the south or west. The northern and eastern slopes of the summit are too steep, but there is a route up the northern corner of the summit from the ridge to Haycock. There is a clear path from Buckbarrow, starting alongside Gill Beck, and the fell can also be climbed up the slopes west of Greendale Tarn. We have one walk that visits Seatallan via Buckbarrow. The summit is large and mainly grassy, with some boulders. The sides drop off fairly steeply to west, north and east, so the views are good (the empty upper reaches of Bleng Dale are seen to good effect). In each direction the summit slopes away enough to ensure that there are good views, but my favourite view is the one east towards Wasdale Red Pike, looking across the interesting western slopes of that fell. 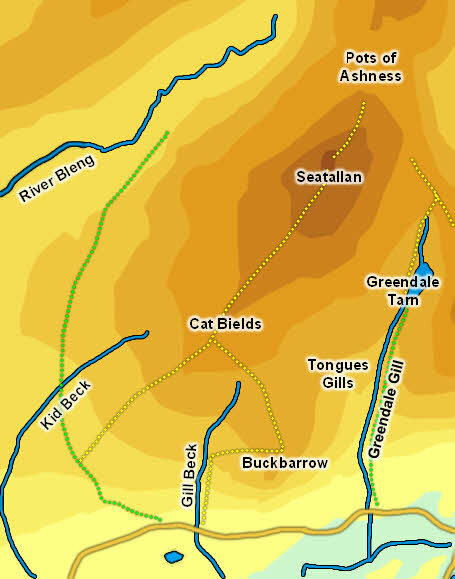 The large area of Seatallan is bordered to the north and west by the River Bleng. In the south the ground levels out close to the road into Wasdale Head, with the River Irt acting as a southern boundary. Seatallan can claim half of Greendale Tarn, which sits in the valley between it and Middle Fell. The tiny Tosh Tarn sits at the foot of the southern slopes, to the south-west of Buckbarrow, but is rarely seen. To the south-east the fell is bordered by Greendale Gill. Small streams flow off each side of the fell, feeding all of the surrounding watercourses. To the east the fell has a short boundary along Nether Beck, but in an unusual formation - there is a gently grassy ledge between the upper slopes of the fell and the steep sided valley of Nether Beck, which feels like it cuts across an existing landscape. Seatallan's best water feature is Tongues Gills, at the top of the first climb on Greendale Gill. Here several streams form a series of tongues that cut their own ravines while the path passes along the other side of the gill. Buckbarrow, at the southern tip of Seatallan, is sometimes seen as a separate fell, but it is really a craggy outcropping at the edge of a ridge that runs towards Wasdale. The crags appear to be a peak from below, but behind them the ridge slopes up to Cat Bields, on the main body of the fell.